One season gardening used to be all I did. Put in the plants in the spring, harvest in July, August and sometimes in September and clean up in October. Then the price of organic produce shot through the roof and I started thinking that there had to be a way to get more out of my dirt than tomatoes, cukes, peppers and eggplant. My adventure with growing more and longer began a bit late in my gardening life but I’m glad it did. Beets are easy to grow. 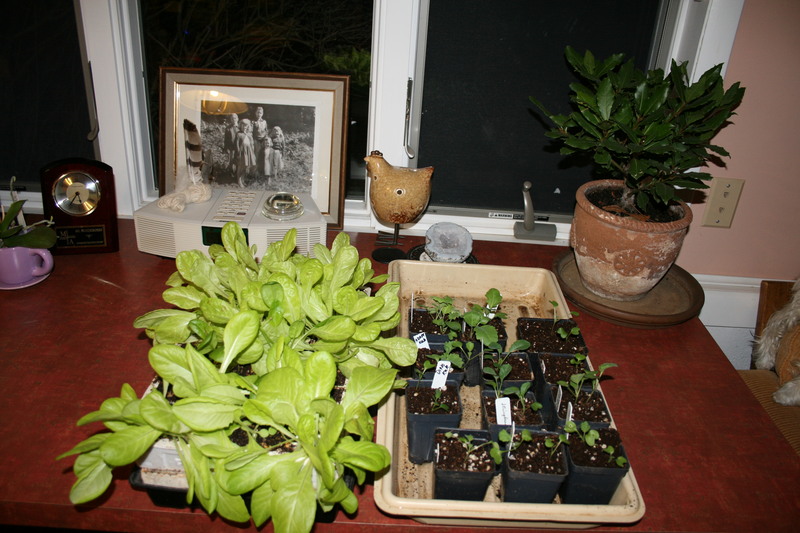 Truthfully, I probably will never get as far as master gardeners like Eliot Coleman of Four Season Harvest fame but I am enjoying cool weather crops like fresh lettuce, spinach and beets from March through October. My mom raised the absolute best beets I have ever eaten. Every time I drove to her farm in the far end of Virginia, she would somehow know exactly when I was arriving. There, on the table, steam rising, butter melting, would be a big bowl of sliced beets, just for me. But I never planted beets in my own garden. Not before she died, not after she died. Then, one day, while browsing through GrowItalian.com, I saw Chioggia beets. Beautiful, round and ruby red on the outside but when you cut them open, there are concentric white bands all the way through each slice. I was in love with beets, again especially since I know how easy it is to grow them. I’ve had beets in my garden now for the last 10 years and think they are among the easiest plants to grow. But if you Google “growing beets,” you will literally get more than 11 million entries. There are only a couple of things you need to know to raise not just 1 but at least 2 crops of beets every year. (That’s how many I can grow in Zone 6.) WARNING: if you ignore what you are about to read, you will get red marbles…that will not cook or eat easy. I know. My first crop was used in a game of ringer. This is one of the most important requirements of beets. It’s also the bit of information I didn’t have when I raised my first crop of red marbles. Beets really, really like loose, well-drained soil. They will put up with soil that’s not rich but it has to be loose. So do some soil prep if you can. It may take a bit of time and effort but it’s worth it; I know. And if you get the soil right, it’s smooth sailing to harvest time. Remove stones since they will hinder growth. If you’re growing in clay, add compost to loosen the soil and keep the soil from crusting after watering or rainfall. And make sure your soil is acidic – beets like a pH range of 6.2 to 6.8. Don’t plant in the middle of your summer season. Beets won’t like it. They are a perfect cool weather crop. Although they can live through the heat (like the rest of us), they prefer a temperatures of 60 to 65 F and bright sunny days. They can also survive cold weather as long as they don’t get caught in a freeze. So, beets are a great, “long-season” crop. Beet seeds are outdoor babies from the get go. As soon as your soil can be worked in the spring, you can plant them. The seeds aren’t really just one seed – each of these little jewels contains a couple of beet seeds. Sow the seeds 1/2-inch deep and I drop each seed about 3 inches away from the other seeds. I also plant in rows about 12 inches apart. Beet seeds are pretty slow to germinate so make sure you keep the bed moist until you see their little heads peeking out of the soil. I usually water a bit, every day. Once they start to pop up through the soil, I keep watering but usually every other day. Once they are established, just make sure that you don’t let them dry out. But don’t over water either. Too dry or too wet and your beets will not be happy. TIP: I don’t thin; I transplant. Most advice online and in books says you have to thin beets rather than transplant. Wrong! Despite what people will tell you, you can transplant beet seedlings and almost double your crop. And it’s easy to do. Just wait until the leaves on the plants are about 2 inches long before transplanting. 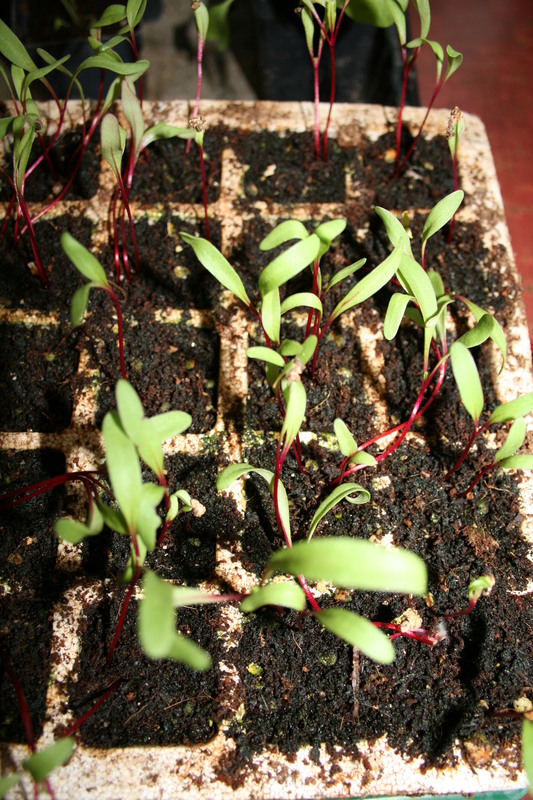 Baby beets ready to grow. The night before the big move, I water the bed thoroughly. Then, early in the morning, armed with a #2 pencil, I head to the raised bed where my beets live. I look for beet plants that are too close together. Because I’m not be most patient person when dropping seeds in soil, I usually find 3 or 4 beet babies clumped together. DON’T PULL THEM OUT ONE BY ONE! Once I’ve found the baby beet clump I want to move, I gently dig around the whole clump and bring up a shovel full of soil with the beet roots intact. Then I push my pencil into the ground, making holes spaced about 3 inches apart, for each of the babies. Teasing the roots apart, gently, (a trick I learned from my Amish neighbors) I drop each beet baby into its own hole, pack dirt gently around it and move on to the next clump. I have not lost one beet baby using this method and I practically double my yield. Oh, and beets are a twofer in my garden – I also eat beet greens in salads. Wait until the leaves are 3 to 4 inches high, then cut a couple off each beet plant. 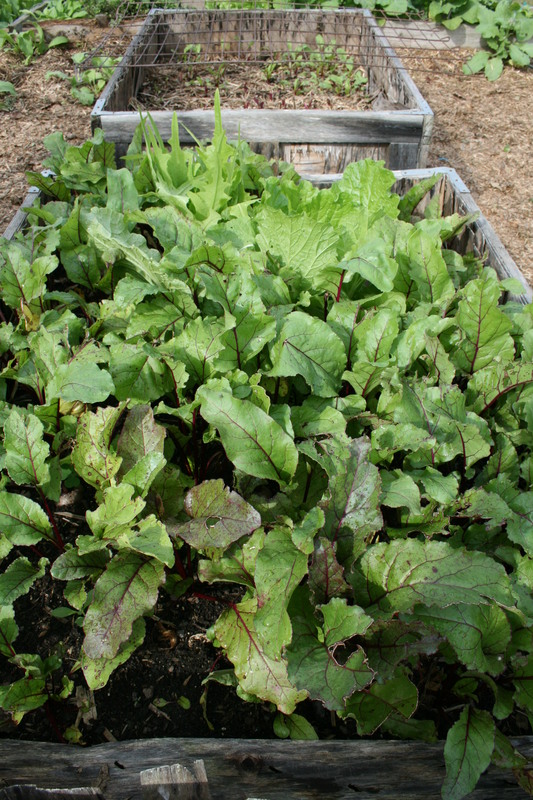 The beets will keep growing and you’ll have some truly delicious greens for lunch or dinner. Like I said, beets are easy peasy. I have never fertilized my beets and they grow like champions. 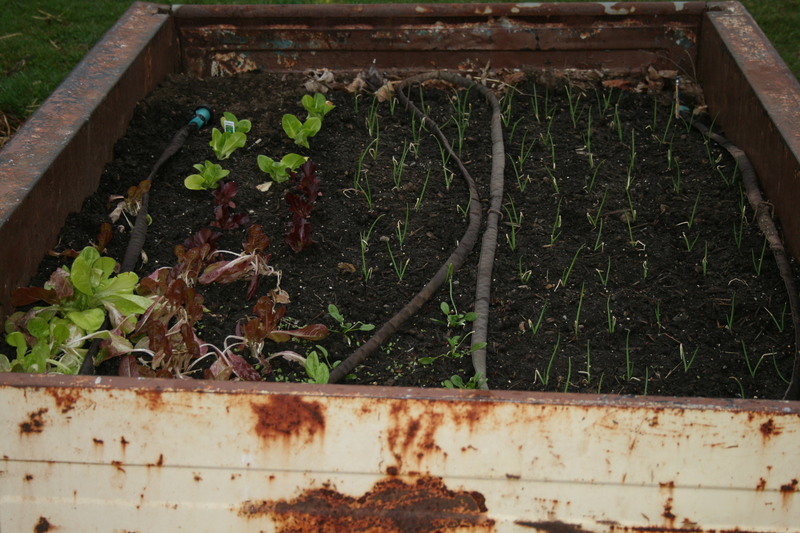 It could be because I enrich my raised beds with a bit of compost every spring. I do put a bit of mulch – straw – down around the plants once I divide and transplant them. It helps hold moisture during the hotter, summer days. I plant in March, April, May then hold off until early August when I start putting in seeds, again. I do that to avoid asking the beet seeds to germinate when the daytime temperature is above 80 degrees. They don’t like it. 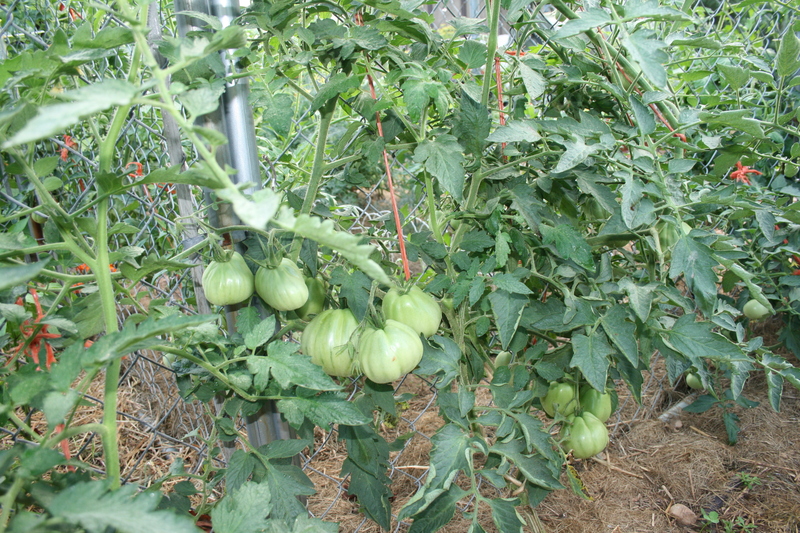 Plant in early August and within 55 to 70 days, you should have your next crop. Try beets. No matter how you slice them…they’re a great addition to any garden. Red Butterhead lettuce makes a soft, beautiful head that’s perfect for salads. I love raising my own lettuce. It’s a love born out of hate. That sounds like an oxymoron but it isn’t. I started raising lettuce when the price for 12 ounces of the organic stuff hit $5.98 a bag. For me, that’s $18 a week for under two pounds of green leafy lettuce. Do the math. I was spending almost $1000 a year on lettuce! Try doing that on a fixed income. two-fer! Save your seeds and pay no more (well maybe you’ll have to buy every 3 or 4 years). Just keep planting and harvesting. So, let’s start with seeds. I am pretty particular about whose seed I buy. I want organic seed, especially if I plan on saving and sowing. 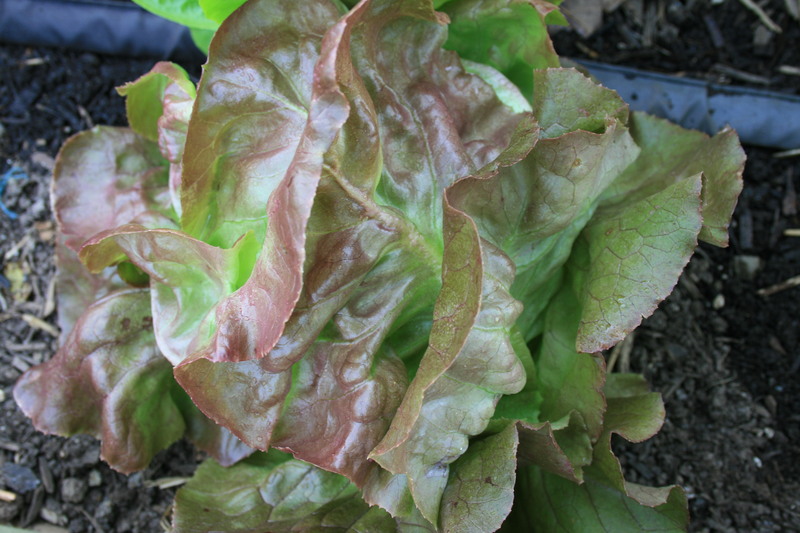 Organic red leaf lettuce grows quickly and tastes sweet by itself or in salads. And I want flavorful leaf lettuce — not head lettuce you have to chop with a cleaver. And I definitely do not want Genetically Modified (GMO) seed. Territorial Seeds – kind of the granddaddy of organic seed growers, this company was organic before organic went mainstream. Family-owned, Territorial Seeds has a fantastic reputation for the seeds it sells and the customer service it brings to the table. Grow Italian – I discovered this company more than a decade ago and it’s my go to seed company for all things Italian including lettuce and mixed greens. When you buy a packet of lattuga from them, you get high quality, high-germinating seeds and a lot of them. I think the hardest part of growing lettuce is picking the kinds you want to try. But once you have your seeds, planting is so easy, you’ll wonder why you didn’t do it sooner. I tend to sow the seeds right in the garden bed. One problem when planting lettuce is that the seeds are small and lightweight and they tend to drop into the dirt in clumps or blow off my hand. I used to have a hard time getting them to spread out on the soil but here’s a trick my sister taught me. Then all you have to do is water every day until the seeds spout. Then water weekly and wait for the lettuce to grow. Don’t plant in the summer! Lettuce, like beets, likes cool weather. You can plant in the spring and again in August for harvest in late September and October. Start lettuce plants indoors if you want. 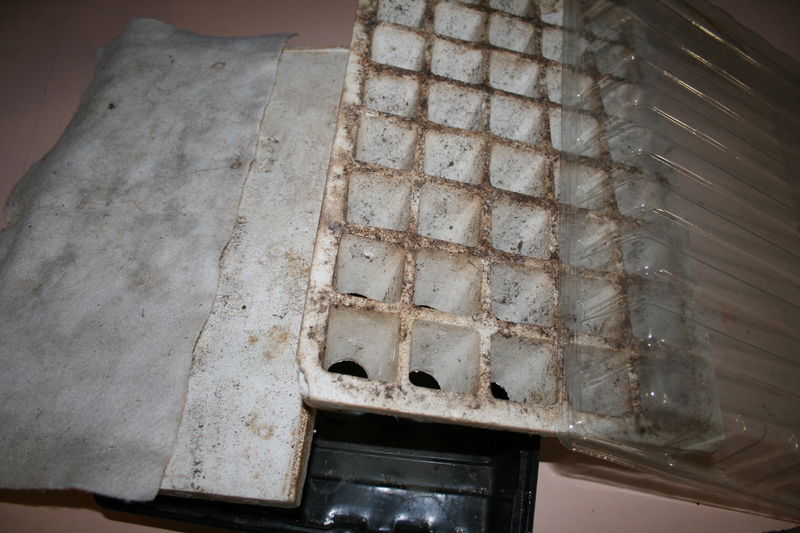 I use 40-cell growing trays. And I start mine in early February. When I transplant, I cover the babies with a small tunnel to protect them from frost. If you want to save the seeds, plant for a spring harvest but only cut the first crop. Let the second set of lettuce leaves grow up and flower. Then wait. It will be tempting to take the flower heads off when they get their puffy, white hair. DON’T. The seeds need to mature. Wait until the heads are dry, brown and about ready to burst. Then pull the seed heads off, take the seeds out and let them dry in a small strainer for a couple of weeks. I refrigerate mine once they’re dry and plant them in the fall. One season gardening used to be all I did. Put in the plants in the spring, harvest in July, August and sometimes in September and clean up in October. Then the prices of organic produce shot through the roof and I started thinking that there had to be a way to get more out of my dirt than tomatoes, cukes, peppers and eggplant. My adventure with growing more and longer began a bit late in my gardening life but I’m glad it did. Truthfully, I probably will never get as far as master gardeners like Eliot Coleman. who authored a favorite book of mine, Four Season Harvest, but I am enjoying cool weather crops like fresh lettuce, spinach and beets from March through October. But I never planted beets in my own garden. Not before she died, not after she died. Then, one day, while browsing through GrowItalian.com, I saw Chioggia beets. Beautiful, round and ruby-red on the outside but when you cut them open, there are concentric white bands all the way through each slice. I was in love with beets, again. I’ve had beets in my garden now for the last 5 years and think they are among the easiest plants to grow. But if you Google “growing beets,” you will literally get more than 3 million entries. This is almost one of the only requirements of beets and it’s one of the most important. It’s also the bit of information I didn’t have when I raised my first crop of red marbles. Beets really, really like loose, well-drained soil. They will put up with a wide range but won’t grow as big or as beautifully. So do a bit of soil prep if you can. It may take a bit of time and effort but it’s worth it; I know. And if you get the soil right, it’s smooth sailing to harvest time. Don’t plant in the middle of your summer season. Beets won’t like it. They are a perfect cool weather crop. Although they can live through the heat (like the rest of us), they prefer a temperatures of 60 to 65 F and bright sunny days but they can also survive cold weather as long as they don’t get caught in a freeze. So, beets are a great, “long-season” crop. Beet seeds are outdoor babies from the get go. As soon as your soil can be worked in the spring, you can plant them. The seeds aren’t really just one seed – each of these little jewels contains a couple of beet seeds. Sow the seeds 1/2-inch deep and I drop each seed about 3 inches away from the other seeds. I also plant in rows about 12 inches apart. Beets seeds are pretty slow to germinate so make sure you keep the bed moist until you see their little heads peeking out of the soil. I usually water a bit, every day. Once they start to pop up through the soil, I keep watering but usually every other day. Once they are established, just make sure that you don’t let them dry out. But don’t overwater either. Too dry or too wet and your beets will not be happy. Most advice online and in books says you have to thin beets rather than transplant. Wrong! Despite what people will tell you, you can transplant beet seedlings and almost double your crop. And it’s easy to do. I wait until the leaves on the plants are about 2 inches long before I try transplanting. The night before the big move, I water the bed thoroughly. 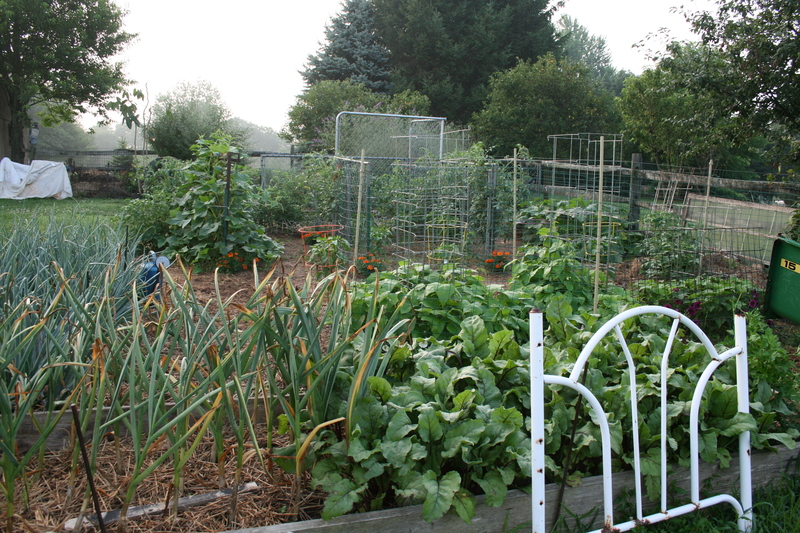 Then, early in the morning, armed with a #2 pencil, I head to the raised bed where my beets live. I look for beet plants that are too close together. Because I’m not be most patient person when dropping seeds in soil, I can usually find 3 or 4 beet babies clumped together. No matter how you slice them…beets are a great addition to any garden. By the way, one of my favorite resources when I am trying to get solid, informed, basic growing information is the so-called “land grant” colleges like Penn State and Ohio State. They usually offer fact sheets like the one on beets that was posted by Ohio State. 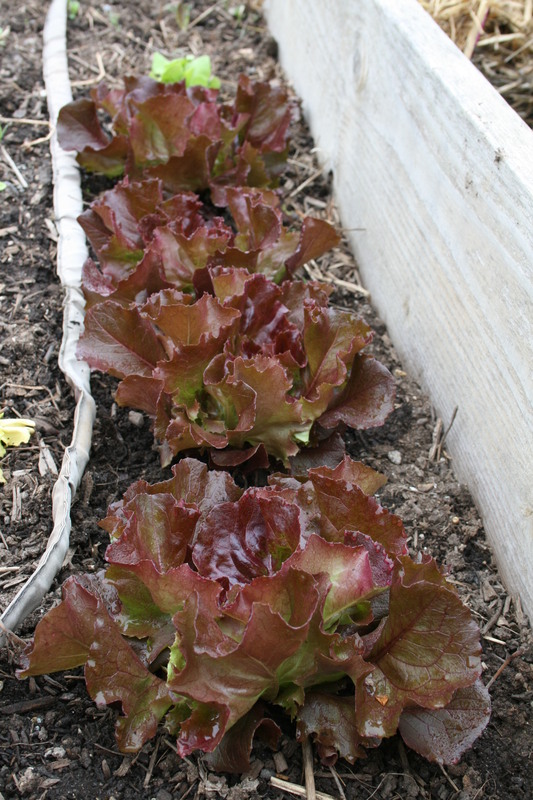 Next week, another favorite in my fall garden (and another easy one to grow) — lettuce! We’re not even through summer vacation but if you want to extend your gardening season, you should already have the plan laid out and maybe even put some of those seeds in the ground! That’s right, late July and early August, especially in my zone – 6b – starts right now! But before we talk about what to plant, when and why, let’s take a quick look at two maps that will help you buy and grow plants best suited to your home town. Who Says I Can’t Grow Avocadoes In My Back Yard? If you live in California or the Florida panhandle, you can grow avocados and other tropical fruits and veggies. You can’t if you live in Pennsylvania. If you aren’t familiar with zones, don’t panic. This isn’t the periodic table of elements. This is the updated (2012) United States Department of Agriculture (USDA) zone map. Gardeners have come to rely on the USDA zone map to choose cold-hardy plants and trees,. Zones aren’t nearly as complicated as some people would like them to be. They just look intimidating at first glance. So, here’s how to read this thing. Find your approximate location in your state. For example, I live in Southeast Pennsylvania so my color is a medium green. Then check the chart on the right side of the map. Based on color and location, my zone is 6b. The coldest my zone is supposed to get is -5 degrees Farenheit. Notice the words “…supposed to be” and take this information with a grain of salt. It’s a guideline, not a rule. The USDA zone chart, which has been published since 1960, helps with getting a handle on when you can set out plants without freezing them to death. And if you look for the zone chart, you’ll find that it’s being used in lots of places that can help you, too. Seed packets, plants, trees and bushes are usually sold with the same zone chart and the suggested planting times. Both help you quickly figure out what will live or die in your backyard…based on environment, alone. Armed with your zone, you could start to make plant choices that work for you. But there’s one other “zone map” you might want to know about before you buy. Recently (1995 and if you’re talking planting, that’s recent), a new zoned map has entered the gardening scene. This one, published by the American Horticultural Society (AHS), looks similar the USDA chart but it tracks heat. Download your copy and start looking it over. This map tells you how many days per year the temperature in your back yard is over 86 degrees. So what? That’s the magic temperature where plants start to suffer from too much heat. Who cares? Why should I track heat? Because it can do as much damage as cold, maybe even more. Frost kills plants, buds and sometimes even bushes and trees, instantly. Heat is a little subtler but just as deadly. And heat damage is even worse during a drought. What should you look for if you suspect the heat is hurting your plants? The AHS says the damage can appear in several places. Flower buds wither. Leaves droop. Leaves may turn brown or even white as the chlorophyll disappears. In his new book, Grow Fruit Naturally: A Hands-On Guide to Luscious, Homegrown Fruit ” , Lee Reich calls the AHS map, “…a work in progress” as it was just recently developed and is still being tweaked. But the heat map is a good guide to understanding how hot it can get in your garden and how much damage heat can do. And it should help you to start thinking about what might have a better chance of surviving once you put it in the ground. Next week, armed with what will survive and thrive in the heat and the cold, we’ll get into what is going into the ground in my garden, right now. Think beets, lettuce and spinach.